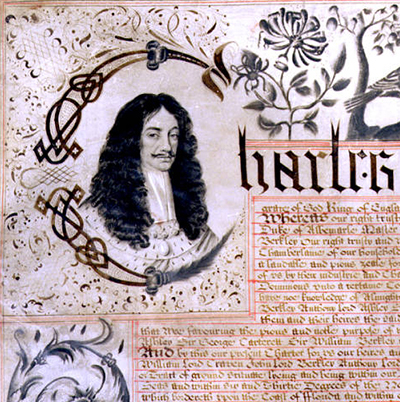 Carolina was a Proprietary colony established by England's King Charles II through the charter of 24 Mar. 1663 that granted eight Lords Proprietors all of the land on the North American continent between the latitudes of 31° and 36° north, extending west to the South Seas (Pacific Ocean). This was the same territory that had been conferred by Charles I in 1629 to Sir Robert Heath as the Carolana Proprietary, which was nullified by the new charter. Named in honor of Charles II, the Carolina Proprietary rewarded courtiers and loyalists who had helped make the 1660 restoration of the monarchy possible. To encompass the settlement north of Albemarle Sound, a second charter was issued on 30 June 1665 that expanded the colony to 36°30' and 29° north latitude, which located the northern boundary on the present Virginia-North Carolina border and the southern boundary in mid-Florida. Powell, The Carolina Charter of 1663 (1954). "Treasures." North Carolina Digital Collections. http://digital.ncdcr.gov/cdm/home/collections/treasures (accessed January 28, 2019). "Original boundaries of Carolina (1663/1665)" ANCHOR. https://www.ncpedia.org/media/map/original-boundaries (accessed January 28, 2019). "The Charter of Carolina (1663)." Colonial North Carolina. ANCHOR. https://www.ncpedia.org/anchor/charter-carolina-1663 (January 28, 2019). Walbert, David. "A little kingdom in Carolina." Colonial North Carolina. ANCHOR. https://www.ncpedia.org/anchor/little-kingdom-carolina (January 28, 2019). Charles II, King of England. Carolina Charter. 1663. http://digital.ncdcr.gov/u?/p15012coll11,6 (accessed October 15, 2012).